Welcome to Douglass Hills Estates! 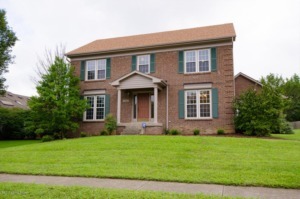 This traditional style brick home is ready for it's new owners! Foyer with hardwood flooring. Dining Room with crown molding. Office or formal living room. Family Room with gas fireplace. Eat-in Kitchen with hardwood floors, bay window and laundry shoot. Master suite and 3 other bedrooms all on the second floor. Partially finished basement with family room, laundry and lots of storage. Freshly painted. New windows throughout. 2 car attached garage. New roof in 2009. Click to schedule your showing.